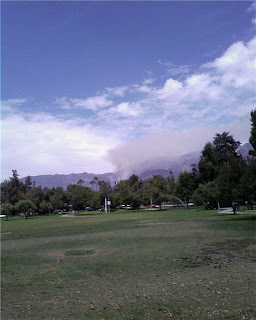 This afternoon around1pm a fire started in the mountains above Pasadena in the Angeles National Forest. Within 30 minutes several helicopters appeared on the scene possibly attempting to rescue hikers stranded on the mountain. It’s a product for those of you who enjoy wood flavored smoked grilling. The product is available in Alder, Mesquite, Hickory, and Applewood. Applewood is my favorite. It’s easy to use and you have no mess or fuss.